So you might have Feng Shui-ed your home, but have you Feng Shui-ed your vision board? If you want visual representations for the goals you wish to manifest, want to give yourself a mid-year goal refresher or even just want to create a new vision board, this post will help you accomplish that in the best way possible. Using the Feng Shui principles, you can create optimum energy flow for your desires! How cool is that? 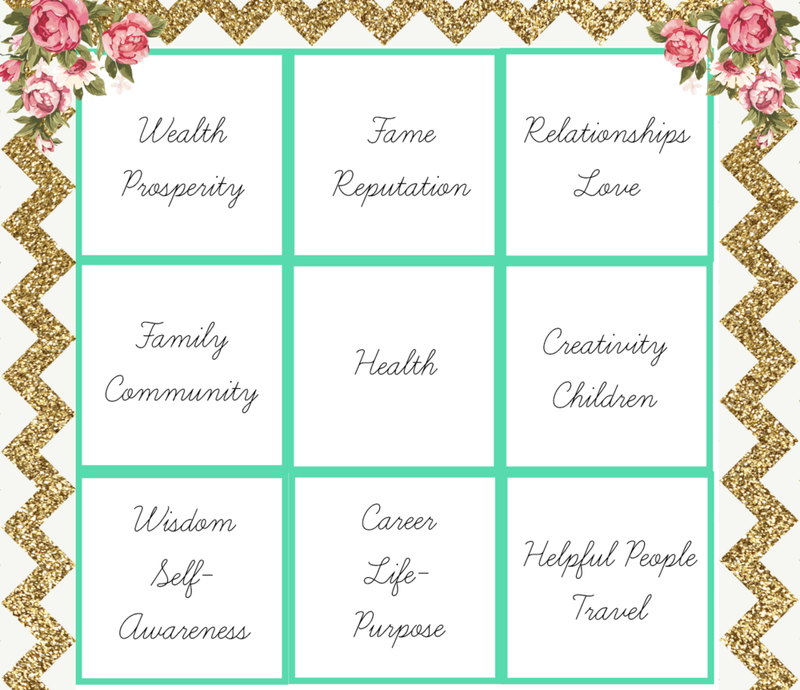 Normally, vision boards are just a jumble of pictures relating to the many desires we have, but creating a sectioned, intention-filled vision board will create an overall sense of well-being and good fortune for the things you wish to manifest. Ready, set, go! A cork board and push pins, a poster board and tape or glue, or even just a piece of computer paper for you to use as your base to put your pictures on. Creativity! Anything you chose can be your own interpretation. A picture of a plant might translate as growth to you in an area, or red roses might represent love and romance. Create your own meanings to each of your pictures you find. Ask yourself "What do I want to achieve, accomplish, and create?" in each of the GUA categories. Search for pictures that radiate what you want for each of these categories and then place them accordingly. IT IS OKAY if your pictures length goes into other gua's because most of the time, gua's work together. If you want wealth and prosperity, you also need to work on your fame and reputation as a person so you can create more visibility and abundance. If you want to be healthy, perhaps you need to be more spiritual/mindful in order to seek out your life-purpose. Start by attaining your base, what you will use to hold the images in place, some coffee, and start going through your chosen picture modality to find images and words that express your desires. After you cut out the pictures, start placing them in their rightful Gua chosen by you. Please let your creativity flow here, create interpretations of your own to really reflect what you want to achieve. For example, I have a picture of a book case in my WISDOM/SELF AWARENESS gua to reflect my goal for more knowledge in my business, spirituality and in myself. I have oranges in my HEALTH gua because to me, oranges are zesty and energetic, and that is how I want to feel. I also have a cookie mix with sprinkles in my CREATIVITY gua because that image reflected a combination of inspirations to create one goal :) Use your imagination! Know that is it okay to have overlapping pictures, all of the guas work together to create optimum chi flow :) For example, my She Means Business Manifesto is in my WEALTH, FAME, and slightly in the FAMILY/COMMUNITY gua. The words on it apply to all of my goals in those sections, so for me that is great! Keep going until your board is full, after this picture was taken I went ahead and filled in the spaces with words I wrote on paper and made everything fit together nicely. Your final step will be to pin everything to your board and viola!